The standard statuses that are in the InLoox Options by default are Rejected, Approved and Open. You can also create individual budget statuses, or edit and delete the existing ones. 1. In Outlook, click on File in the upper left hand corner and click on InLoox Options. 2. Navigate to Budgets >> Budget status in the folder structure. 3. Click on New to create a new budget status. 4. 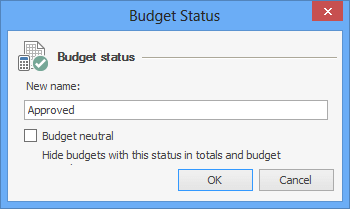 Edit your new budget status in the dialog window. You can also decide whether budgets with that status are budget neutral or budget relevant. 5. Click on OK to save your new budget status. Manage the budget statuses in InLoox 9 • Copyright 1999-2019 © InLoox, Inc. All rights reserved.